Internet Protocol version 6 (IPv6) is a protocol introduced to replace Internet Protocol version 4 (IPv4) in order to solve the IP Address exhaustion problem. Although IPv4 is still being used, some Internet Service Providers (ISPs) already require setting up IPv6 on the router to activate your Internet connection. IMPORTANT: Not all Linksys routers are IPv6-compliant. Access the classic web-based setup page of your router. To learn how, click here. NOTE: If the IPv6 Setup sub-tab is not showing, you might need to update the firmware of your router. To learn how, click here. 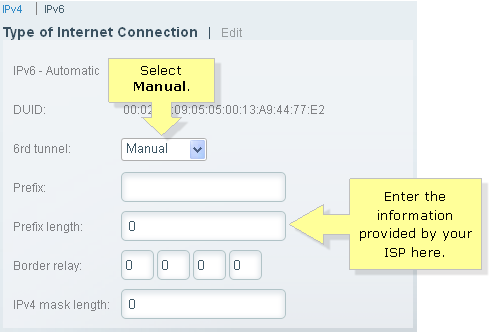 In the Internet Connection Type section, select Disabled for IPv6 - Automatic. In the 6rd Tunnel section, select Manual Configuration. Enter the information provided by your ISP in the Prefix, Prefix Length, Border Relay and IPv4 Address Mask Length fields. NOTE: A 6rd Tunnel allows your router to send IPv6 IP Addresses over IPv4 networks. IPv6 should now be enabled on your Linksys router. Access your Linksys cloud account. To learn how, click here. Click the Internet Settings tab. Click IPv6, then click Edit. 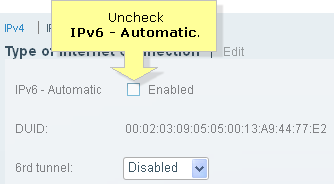 Uncheck IPv6 - Automatic to enable the 6rd tunnel options. Select Manual in the 6rd tunnel option. Enter the information provided by your ISP in the Prefix, Prefix length, Border relay and IPv4 mask length fields.